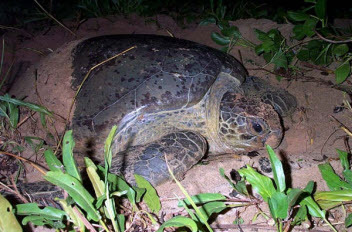 Oil and Sea Turtles presents a basic overview of sea turtle biology, summarizes what is known about the effects of oil on sea turtles, reviews potential response actions in the event of a release, and presents case histories from previous spills. Download the Report: Oil and Sea Turtles: Biology, Planning, and Response [PDF, 2.0 MB]. Originally published in 2003, this report was reprinted in July 2010. Funding for this publication was provided through NOAA's Coral Reef Conservation Program, which is designed to protect and restore the nation's coral reefs and assist conservation of reef ecosystems internationally. This program includes efforts to monitor and assess coral health, map coral reef ecosystems, conduct research to better understand biological, social, and economic factors that affect coral reefs, partnerships to reduce the adverse effects of fishing, coastal development, and pollution, and identify coral reef areas for special protection. Areas of oil and gas exploration, transportation, and processing often overlap with important sea turtle habitats. Sea turtles are vulnerable to the effects of oil at all life stages—eggs, post-hatchlings, juveniles, and adults in nearshore waters. Several aspects of sea turtle biology and behavior place them at particular risk, including a lack of avoidance behavior, indiscriminate feeding in convergence zones, and large predive inhalations. Oil effects on turtles include increased egg mortality and developmental defects; direct mortality due to oiling in hatchlings, juveniles, and adults; and negative impacts to the skin, blood, digestive and immune systems, and salt glands. Environmental Sensitivity Index (ESI) Maps: ESI maps are spill response tools that portray shoreline characteristics, natural resources, and human-use resources for an area. Turtles are a major feature of the ESI maps for Florida. Barge Morris J. Berman: On January 7, 1994, the barge Morris J. Berman went aground in the surf zone off Escambron Beach in San Juan, Puerto Rico. Barge Morris J. Berman Spill: NOAA's Scientific Response [PDF, 1.8 MB]: This 1995 report discusses major response issues related to the 1994 grounding of the tank barge Morris J. Berman in San Juan, Puerto Rico. Fort Lauderdale, Florida, Mystery Spill: At approximately 10 am, August 8, 2000, NOAA was notified of a mystery oil spill washing up on the beaches from North Miami to Pompano, spanning approximately 25 miles of the east coast of Florida. Oil Tanker SS Witwater: On December 13, 1968, the oil tanker Witwater broke up in heavy seas off the Atlantic coast of Panama. Ixtoc I Well Blowout: On June 3, 1979, the 2-mile deep exploratory well, IXTOC I, blew out in the Bahia de Campeche, 600 miles south of Texas in the Gulf of Mexico. Nowruz Oil Spill: In 1983, the Nowruz Oil Field in the Persian Gulf, Iran, was involved in a number of oil pollution incidents. Oil Tanker Alvenus: On July 30, 1984, the U.K. Tank Vessel Alvenus grounded in the Calcasieu River Bar Channel 11 miles southeast of Cameron, Louisiana. Barge Vista Bella: On March 6, 1991, the Vista Bella sank in the Atlantic Ocean approximately 12 miles northeast of Nevis Island (British). Barge Bouchard B155: On August 10, 1993, the freighter Balsa 37, the barge Ocean 255, and the barge Bouchard 155 collided in the shipping channel west of the Skyway Sunshine Bridge south of Mullet Key in Tampa Bay, Florida. Oil Spill Case Histories: 1967 through 1991 [PDF, 1.7 MB]: This document summarizes significant U.S. and international spills between 1967 and 1991. In the Bookmarks section on the left, click the name of a spill: Alvenus, IXTOC I, Nowruz Oil Field, Vista Bella, and Witwater. Oil and Hazardous Materials Response Reports: This page offers summaries of oil and chemical spill responses in which NOAA OR&R participated between September 1992 and September 1999. To read about the barge Bouchard 155 spill response, choose "Response Reports: 1993." To read about the Morris J. Berman response, choose "Response Reports: 1994."